Everyone wants to feel slim, fit into the perfect outfit and be the ideal weight. But with the abundance of carbohydrate-rich snacks, limited schedules to make it to the gym and the dangerous popularity of fad diets, weight loss is becoming increasingly difficult to achieve. How are you going to lose the weight? Greens Plus Thermo Lean. Herbal fat burners are used to safely accelerate your metabolism. 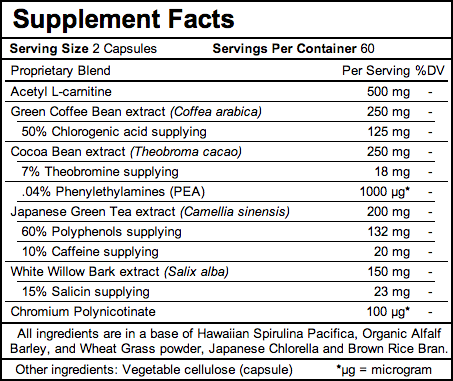 What makes Thermo Lean even more effective is the addition of green coffee bean to an already potent formula. The extract of young, unroasted coffee beans supplies chlorogenic acid, a glucose modulator, fat inhibitor and potent antioxidant. Cocoa bean extract enhances mood and supports brain chemistry associated with exercise, while chromium helps to stabilize blood sugar. All ingredients are in a base of green superfoods that provide essential vitamins, minerals, antioxidants and enzymes needed for peak performance. How to enjoy: As a dietary supplement, 2 capsules of Thermo Lean should be taken twice a day with eight (8) ounces of pure water, preferably twenty minutes before breakfast and lunch. To achieve maximum fast loss, Thermo Lean should be combined with daily exercise and a complete dietary strategy. Rich in antioxidants, with 7% Theobromine and 0.4% Phenylethylamines (PEA), cocoa bean extract enhances mood and supports production of endorphins, healthy brain chemicals associated with exercise. Young, unroasted coffee bean extract supplies 50% Chlorogenic Acid, a potent antioxidant, glucose regulator and fat inhibitor. Loaded with 60% antioxidant Polyphenols, 10% Caffeine, and 6% Catechins including Epigallocatechin-gallate (EGCG), green tea extract increases energy, quickens the metabolism and helps burn stubborn body fat. The herbal origin of aspirin, Salix alba has been used for thousands of years in tradional medical formulas throughout Egypt, Europe and China. An ionic-bond of the essential nutrients chromium and niacin, Chromium Polynicotinate is a vital component of Glucose Tolerance Factor (GTF), responsible for binding insulin to cell membrane receptors and stabilizing blood sugar levels.